Adam Jonas isn’t Nostradamus, but the Morgan Stanley analyst is predicting the road to complete vehicle autonomy will begin in 2026. What’s more, he says the technology will eventually reach 100 percent market penetration two decades later. Wall Street forecasts aren’t generally superior to the dart-throwing monkeys, but they do create great charts. At end-2018 we can reality-test the Adam Jonas report: there should be at least a couple of full-autonomous offerings on the market. The majority of media reports I see on robocars are focused on the idea that Danny-the-driver sells his Prius, buys his first robocar — but continues to drive to work every day. The “big change” is that now Danny can TXT while not-driving instead his usual TXTing-while-driving, otherwise known as DWD, Driving While Distracted. That will save a lot of lives, including those of cyclists like myself. But that isn’t the significant revolution. The real revolution will be most obvious in high density cities like New York or San Francisco. High robocar penetration will happen there first because of the appeal of “whistle-cars”. We are already seeing this in the explosive growth of Uber, Lyft and similar services. Urbanites are proving they prefer to summon a just-in-time ride on their iPhone. Robocars will make this service even more convenient and a LOT cheaper. That’s pretty much the end of the self-owned urban car market. Even earlier than the whistle-car we will see delivery-bot vehicles. This is where Amazon is going with their drone development program. The drones will be the “last block” of the delivery web. The delivery-bots will handle the larger, heavier delivery loads and supply the drones and the human powered deliveries. American cities typically have 40 to 50% of their useable area eaten by automobiles, comprised of streets and parking. Most of that space can be released to productive use once robocars and delivery-bots reach full penetration. Perhaps cities will even allow building again – so the acute shortage of affordable housing can be eliminated. Or maybe not – the same old status-quo people will probably still control the city governments. And they already have their multi-million dollar positions – no “housing crisis” for them. 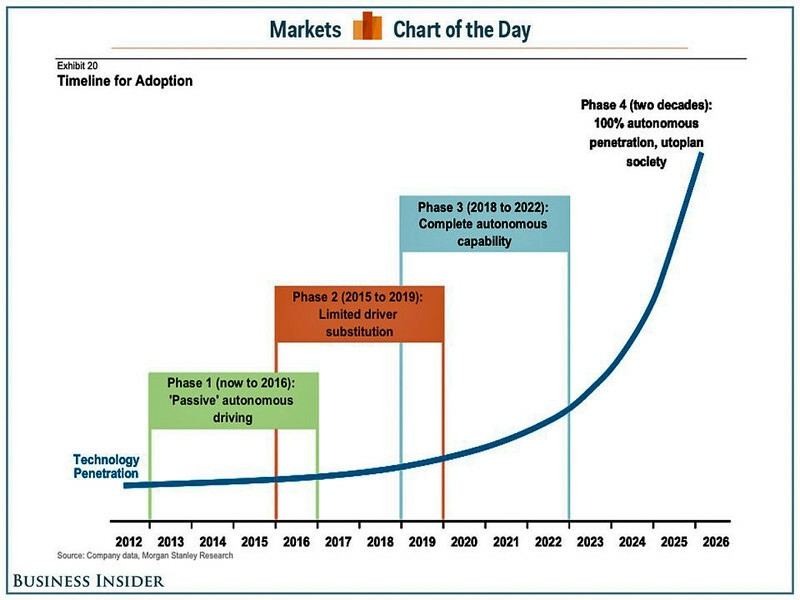 Brad Templeton has done more work on the implications and impacts of robocars/self-driving cars than anyone I know. There are dozens of thoughtful essays on his site, and he is now a consultant to Google’s self-driving car team (can’t talk about that of course – too bad). This longish essay speculates on the impacts of robocars on patterns of city development. This essay examines the potential future big changes to cities as a result of robocars. Most of these changes will be inspired by one key element of robocars: because they can drop passengers off, and then go do other work or park themselves densely in more remote lots, the need for large amounts of parking surrounding commercial buildings should diminish greatly, particularly in suburbs and non-central urban areas. If the land devoted to parking can be repurposed, what does that mean for the city? See Brad’s main robocar page: Where Robot Cars (Robocars) Can Really Take Us. I learn something every time I visit.